A woodcut from Harpers Weekly, July 20, 1861. The woodcut shows workers choking cartridges. Though taken from an arsenal in Massachusetts three years before the Washington Arsenal, the picture is a very good depiction of what the workers at the Washington Arsenal would have been doing on June 17, 1864. We are pleased today to welcome back guest author Ryan Quint. In the midst of the 150th Anniversaries of the Overland Campaign, the road to Atlanta, and the opening shots of Petersburg, it is easy to overlook other events that occurred during the summer of 1864. One of these events is the June 17, 1864 explosion at the Washington Arsenal in the District of Columbia. The Arsenal was located along the banks of the Potomac River where everyday workers produced a wide variety of material needed for the Union war effort. On average, the employees at the Arsenal could create, box, and ship out 21,000 rifle cartridges a day. Young children, employed for their small hands, varnished 7,000 percussion caps an hour. 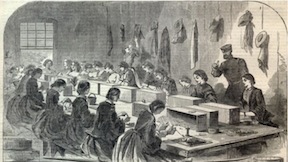 In the middle of the Arsenal grounds was the laboratory, where a corps of 110 women labored in 12-hour shifts, producing the bullets that would soon be sent to Petersburg and other battlefields. These women ranged in age and social status, but most fell into their early twenties and had been hired because of the economic need. Sally McElfresh was likely the youngest girl at the laboratory; she was 12 years old. The women worked at long tables inside the laboratory, sitting next to each other on hardened benches. Wearing bulky dresses, it was nearly impossible to quickly get up from the benches; if a woman in the middle of the bench wanted to get up, the whole row had to slide off the end and allow her exit. This time-consuming process would have deadly ramifications on June 17. Within the walls of the laboratory, the women worked mostly at “choking” cartridges. This entailed taking paper cartridges that had already been partially filled with black powder and inserting the rifle bullet, then tying, or ‘choking’ the whole round with some thread. The choked cartridges were then loaded into boxes of 1,000 each. The end result, while filling boxes quickly, also left loose powder lying about the tables and floor of the laboratory. Early in the morning of June 17, the Washington Arsenal pyrotechnist, a man named Thomas Brown, began to produce fireworks for the upcoming Independence Day activities in the nation’s capital. Brown created hundreds of stars, a type of firework made up of wet clay packed tight with black powder and other explosives. Laying the stars out on large sheets, Brown put the sheets behind a large pile of timber so that they could dry throughout the day. June 17 was a hot day in Washington: by 7 a.m. it was 72 degrees, and by 2 p.m. the mercury was recording a temperature around 92 degrees. But by 2 o’clock, disaster had already struck at the Arsenal. The sun’s rays did more than dry Thomas Brown’s stars—they cooked them. Behind the pile of timber, no one noticed when the fireworks began to smoke and fizzle. Then, around noontime, they exploded. Nearby, the laboratory’s windows had been thrown open to allow any type of breeze into the stuffy confines near the benches. But when the fireworks exploded, the flames sped alongside the wind and the fire leapt through the open windows. Sparks and flames lapped at the benches, and before anyone could do anything about it, the loose powder and choked cartridges became engulfed in a massive fireball. 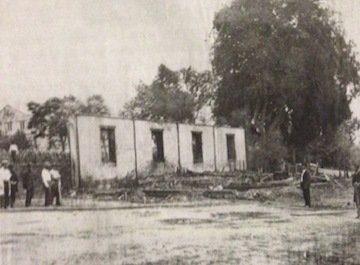 The debris of the laboratory following the explosion on June 17. The large explosion and ensuing pall of smoke drove many to the Arsenal grounds, but there was little they could do. By the time that many arrived, all they could do was help extinguish the flames and then begin the work of retrieving the dead. Making their way through the debris of the explosion, many of the recovery teams were forced to, “place boards under each one in order to remove them from the ruins,” because of the condition of the corpses. The dead were placed under large canvas tarps with the hope that they could be later identified. Many weren’t; Johanna Connor’s remains were only identified by a piece of her dress that had been burned onto her body. For those interested in reading more into Washington Arsenal Explosion, truly an underappreciated event during the capital’s Civil War history, I highly recommend Brian Bergin’s The Washington Arsenal Explosion: Civil War Disaster in the Capital,” published posthumously by the History Press in 2012. Most of my notes come from Bergin’s excellent book. Ryan Quint was born and grew up in Maine, and fostered an interest in the Civil War since very early in grade school. After he graduated high school, Ryan chose the University of Mary Washington in Fredericksburg because of its proximity to the battlefields and National Park Service. He has been a volunteer at Fredericksburg & Spotsylvania NMP for more than a year, and this fall will be heading into his senor year as an undergraduate. This entry was posted in Arms & Armaments, Civilian and tagged armaments Thomas Brown, civilians, Noah Brooks, Ryan Quint, Sally McElfresh, Washington Arsenal Explosion. Bookmark the permalink.